Where can I get a great deal on a laptop? I’m looking for a laptop for my son and was wondering where the best place to buy one online would be. What do you think? Anyone who is remotely connected to computers will probably recognise this question. Relatives, friends, strangers, all seem to think that because you work in IT, you have some sort of insider knowledge as to what the best PC to buy is and where the cheapest place to get it from is. Well ok, maybe we know a bit more than the man in the street, but knowing which website has the best deal isn’t always the easiest thing in the world. Every dealer I know tends to have promotions on at different times, prices vary depending on what you want, and getting the cheapest price isn’t always an indication of what sort of support you can get. Still, I do have a suggestion if you know what sort of laptop you want. The proliferation of the Internet has given rise to a type of website specialising in comparison shopping between different retailers. What these websites do is monitor a large number of retailers and collect prices of all the same item. Then, when a user searches for a particular item, they show all the offerings from different suppliers in one place so that you can make an educated decision as to where to get the cheapest item. So, let’s say you wanted to compare notebooks for example. 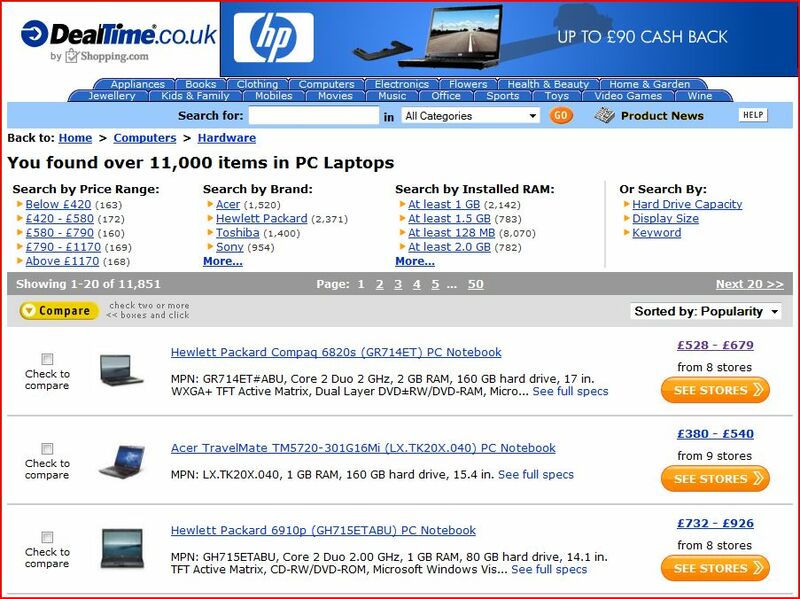 We can pop onto Dealtime or Shopping.com and give a search and see what comes back. Dealtime comes back with a list of different notebooks available. The top part of the screen lets you filter your results and focus on particular specifications or brand, but if you look at the bottom part of the screen, you can start seeing a number of different alternatives. If you look on the right hand side of the results, you’ll see that each notebook has a range of different prices; this is because different retailers sell this notbook for a different price. Let’s click on the price range to get more information. 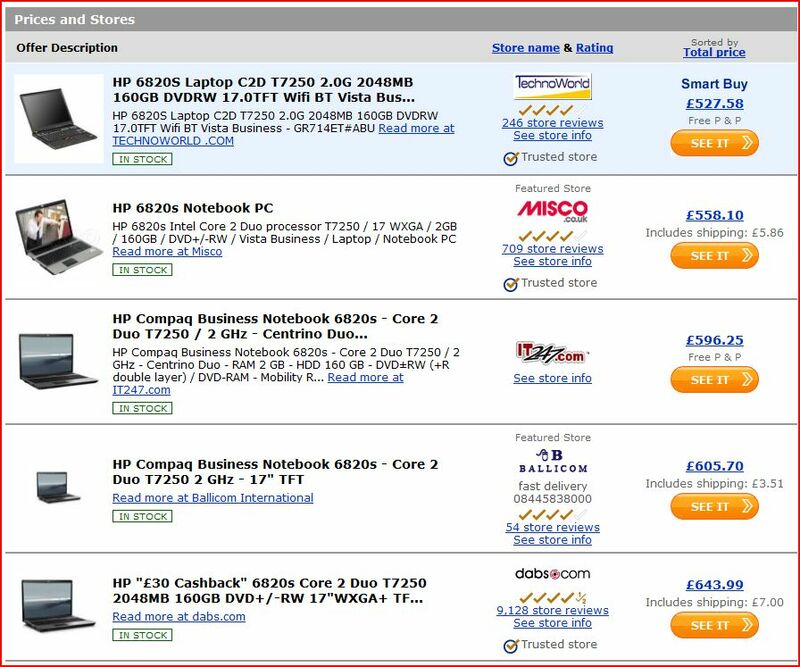 Here you can see the detailed results, showing the same laptop from different retailers or dealers. You’ll immediately notice that there’s usually quite a spread of prices, sometimes as much as 50% difference in the price from one retailer to the other. Dealtime also has a system of reviews so you can use other people’s experiences to help you decide which one to use. It’s actually quite a clever system that can help you get the best price for a particular item, especially if you know exactly what you’re after. Give it a try, you won’t be disappointed. ← Previous Previous post: How can I make sure my password is secure? Next → Next post: How can I protect my blog from getting hacked?